Froki's Shack is an isolated hunter's shack nestled in the southern mountains of the Rift. The Nord hunter Froki Whetted-Blade lives here with his grandson Haming, a survivor of Helgen. He is a follower of the old ways and a devout worshipper of Kyne. Froki will guide you through the Sacred Trials of Kyne if you allow him. It consists of one area, Froki's Shack. To the left of the entrance is a basket containing a leather strip, two loose and a quiver of iron arrows, and also a woodcutter's axe. To the right of the door is a cooking pot. In the cliff below the shack, there is an orichalcum ore vein with a diamond visible and collectible on the surface of this vein. There is a pickaxe on the ground beside the vein. There is a purple mountain flower and gourd growing near the wood chopping block. 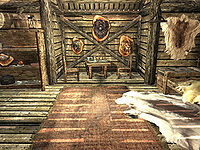 A shrine of Talos can be found outside of the hut further south in the mountains, surrounded by steel cuffed boots, an Imperial light shield, a copy of the Two-handed skill book King, a copy of The Amulet of Kings, a satchel, five loose gold coins, a large coin purse, a bottle of alto wine, a heavy Imperial helmet and an Imperial sword. There are two snowberry bushes on the way from Froki's shack to the shrine. Upon entering you will find a steel battleaxe to the left of the door. There is a tanning rack on your left, with a large shelving unit next to it. Contained on the shelves is a woodcutter's axe, an eye of sabre cat, a pine thrush egg, a plate, a copy of the Archery skill book Vernaccus and Bourlor, a nirnroot and an orange dartwing. Opposite the door is a small table and two chairs; on the table are a cup, two plates, a luna moth wing and a butterfly wing. Against the southeast wall is a single bed and an unlocked chest containing minor loot. On the wood chopping block outside to the north-northwest of the hut, you can find a Diadem of the Savant, which respawns. It is possible this was a mistake, as the Creation Kit specified that the diadem was meant to be a reward for completing Shalidor's Maze, and not appear anywhere else. 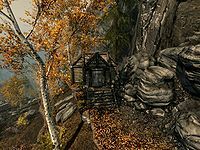 This issue has been addressed by version 1.2.5 of the Unofficial Skyrim Patch; it changes this instance of the diadem into a leveled circlet with a Fortify Archery effect.